For those who dare take the plunge into the live arts, it is both a curse and a blessing. There is nothing quite like the collective state of emergency and sheer terror that comes from being part of an ensemble of artists who take the risk of total failure. Yet, it is in this realm of the live that we might discover something ecstatic, which can only reveal itself in the present tense of the Now. On Saturday July 29th, 12 artists from France, Poland, Italy, US, Canada, Portugal performed #NeWWWorlDisorder, engaging an elusive phenomenon we might refer to as exquisite simultaneity. 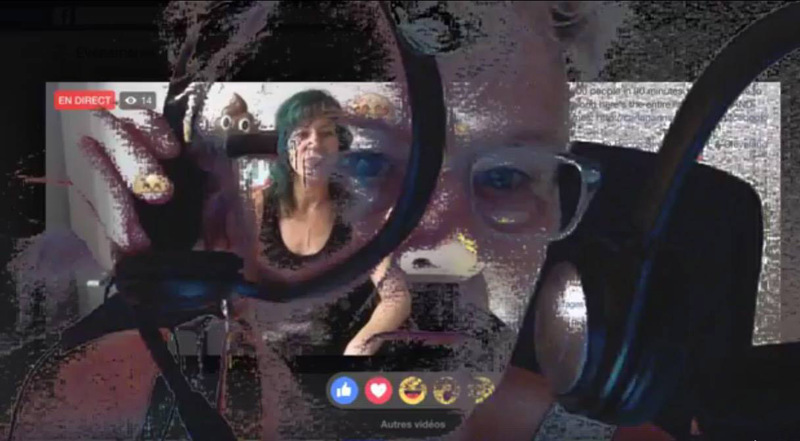 Each artist-broadcaster, independently and collectively, performed their broadcast as an aggregate via Facebook Live. For 90 minutes. from locations that included homes and studios, the Open Space Arts Society Gallery in Victoria BC, and the Pigeon River in Canton, North Carolina: we transmitted a distributed juxtaposition of composited, intertwingled, streaming disorder. We go back in time 27 years to Theater Artaud in San Francisco, where I directed the West Coast premiere of Karlheinz Stockhausen’s music theatre work, Originale, a Happening on the grand order of disorder, which brought together 30 performers, musicians, actors, and technicians for a 94 minute free-for-all of piano, percussion, electronics, street performance, action events. Originale (1990): Don Baker (percussion), Ed Herrmann (electronics), Hitomi Ikuma (action painter), Barney Jones (actor), Paula Levine (videographer), Sigi Torinus (videographer), Chris Maher (action musician), Jan Martin-Risk (wardrobe), Milena (child), Michael Orland (piano), Randall Packer (director), Michael Peppe (action musician), Jim Quinn (lighting designer), Henri Steele (director), Pamela Z (street musician), Richard Zvonar (electronic musician) and Lisa Apfelburg, Elena Rivera, Diane Robinson, Tracy Robinson as actors. It has taken me a very long time to transfer the live chaos of simultaneous theater performance from the stage to the network. And despite the fact that the live Happening was re-situated from the physical space to networked third space, the result is uncannily similar: a spectacular celebration of performative disorder with all of its accidents, surprises, and nonsensical, purposeful juxtaposition. #NeWWWorlDisorder – Annie Abrahams performance with Carla Gannis in composite. There is no doubt that networked space offers a new dimension for staging Happenings, actions, social broadcasting, and other uncategorizable forms that rely on real-time moments in time and space for their realization. In fact, networked simultaneities are the new world disorder we live with each and every day, in our socially-mediated conversations and interactions distributed far and wide. So #NeWWWorlDisorder is really nothing new at all, it is simply a frame around 90 minutes of online disorder to capture the beauty of intentional chaos and distributed simultaneity. It is nothing more than what artists do, articulating and re-framing the everyday as sublime by taking note of the magic that occurs when we activate and re-energize time and space as a stage for our collective work.